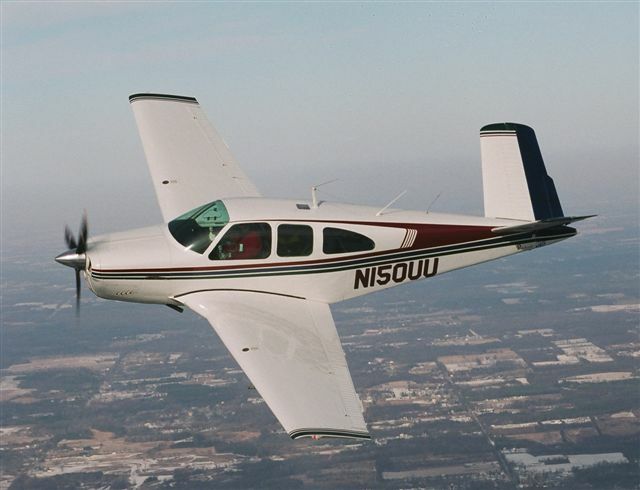 This Beechcraft Bonanza is owned by Mike Schupp. "Bananas" are one of the very finest, fastest, and most desirable general aviation planes ever built. The V-tailed model was introduced in 1947 and was produced until 1982. The straight tailed model, originally dubbed the "Debonair" was introduced in 1959 and is still produced today although Beech reverted to the original "Bonanza" name when the V-tail was dropped. The V-tail was a little lighter than the straight tailed model and, thus, three or four knots faster. The V-tail configuration of the vertical stabilizer in the resulted in the plane being dubbed the "fork-tailed doctor killer" because of the propensity of wealthy doctors with large egos and low hours to stuff their beautiful A35's into hillsides. The problem had far more to do with the plane's center of gravity (CG) than the design. The Bonanza will easily carry four (some have five seats) and luggage and some pilots would fill the fuel tanks, load in four golfers and their luggage and take off. They would be able to get airborne but as the fuel burned off (the fuel tanks are in the wings at the leading edge, as are most) the CG would shift aft causing the nose to lift, particularly when coming in to land. This could force the plane into an unrecoverable stall and the plane would drop to ground on her tail. In any case, the straight tail A36 was introduced to mitigate safety concerns and increase overall sales (although the V-tail continued in production). It must have worked because the A36 is still being produced today and is still considered the finest general aviation plane one can buy. Look at the nicely detailed paint on this one - the way the wingtips define the package and the reclining hash stripes behind the cockpit. Very tastefully done.